Ring Details: Simon G platinum design with antique style caviar beading. 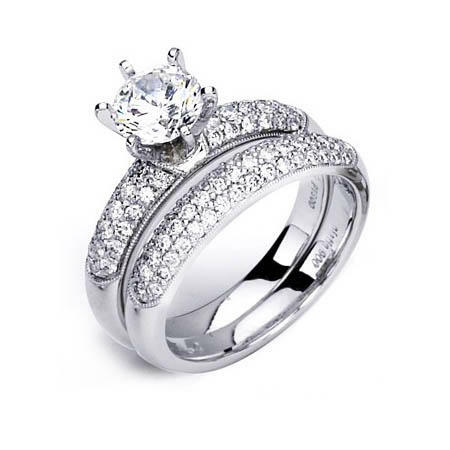 Simon G created this antique style diamond engagement ring setting and wedding band set of handcrafted platinum and pave set round brilliant cut white diamonds of G-H color SI clarity. Caviar beading creates the unmistakable antique style effect. The center diamond is sold separately. View our inventory of G.I.A. and E.G.L. loose certified diamonds.target="_blank">loose certified diamonds.